A tasteful compilation of jazz classics and an interesting arrangement of popular tunes recorded LIVE in the vibrant city of Shanghai. Performed on piano, electic bass, drums and the particular vocal styling of Alexia Gardner. Alexia's 2nd LIVE album. 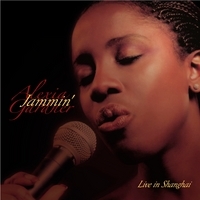 Alexia's second Album - 'Jammin' Alexia Gardner, Live in Shanghai' - is a wonderful follow-up to her debut album -'The Rest Of Your Life'. Once again it was recorded in a "Live" setting which captures Alexia's unique command of a "Live" audience. She interacts easily with her listeners and has the abilty to keep them 'spellbound'! This cd has a strong audience participation and a fun, in-the-moment, feel to it! It is the culmination of a 6 month residency at JC Mandarin - a luxury five star hotel - in the middle of down-town Shanghai! There is a warmth and ease of playing between the band members. A together-ness that came from their Thursday - Saturday feature at the Hotel. The Room - The Wine Bar and Grill - was a warm, dark, intimate setting, hues of red decour making it a fitting, late night jazz concert! Dr Dwight Dickerson is on piano. He is from Los Angeles, California. A master on the piano. A Professor of music as well as a truely outstanding musician. You will hear his strong, distinct style throughout the cd. Alexia feels she is very fortunate to have him play on her second album. The electric bass, in this ensemble, brings a strong, fat, bass sound throughout. It provides a superb contrast to the accoustic bass of the first album. Nicholas McBride - an Australian - is a master on the drums. He adds his gentle brushes for the soft ballads and mid-tempo feels and a funky or reggae or swing rhythm when needed. All three musicians furnish Alexia's light, warm jazz side as well as her swinging, up-tempo, fun songs. Alexia Gardner is a British girl of Jamaican parents, currently based in the art city of Basel, Switzerland. Her tours and concerts have brought her to this fascinating recording. This Global exposure is particularly reflected in Alexia's second album. She chose to open and close her cd with a glimpse of a traditional Chinese Song -'The Moon Shines On My Heart'. A beautiful ballad which then slides effortlessly into the traditional jazz feel of the next track - 'Cheek to Cheek'. This is a really groovy cd! An enjoyable cd! A "must have" in your collection of LIVE recordings. \"Jammin\'\" Alexia\'s second album, is just a CD you listen again and again with the same pleasure and happiness. I discovered Alexia\'s music by a friend of mine and have been immediately captivated by Alexia\'s velvet voice and this unique way she has to make any songs her own. A wonderful CD and a fantastic vocalist! Love it! A refreshing compliation of live music! Yep! A refreshing compliation that captures a moment in time and suspends you there. For those moments when you simply NEED to be entertained. And so beautifully done! A refreshing compilation of live music that captures a moment in time, and takes you there! For when you simply want to be..... extertained. Beautifully done! Live indeed!! !A vocal stylist extreme! You know how to turn a phrase sugah! I Love this CD, God Bless!!!!! This Is A Terrific CD! doesn't offer....this is Special! Congratulations!